A BOLT OF GOLD: NOT EVEN CLOSE! 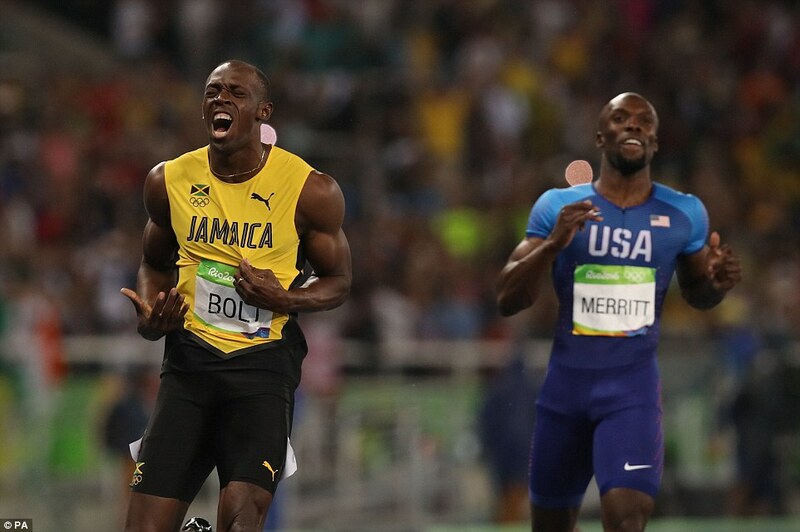 USAIN BOLT claimed his eighth Olympic gold medal and tore up the record books once again. The Jamaican is now one day away from landing the ‘triple triple’ and he will attempt to complete the incredible feat in the Rio 2016 Stadium on Friday evening. 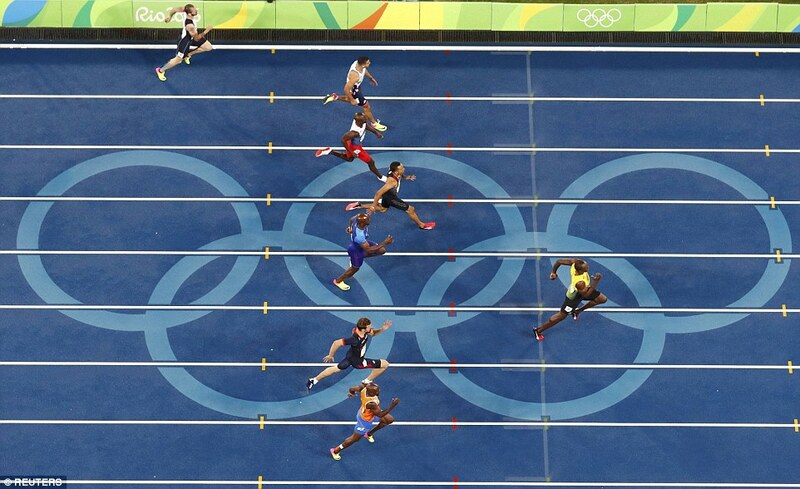 Bolt easily swept his competition and stormed home to clinch the 200m gold in a time of 19.78. But Bolt couldn’t help but wipe the immediate disappointment off his face when he realized his time. 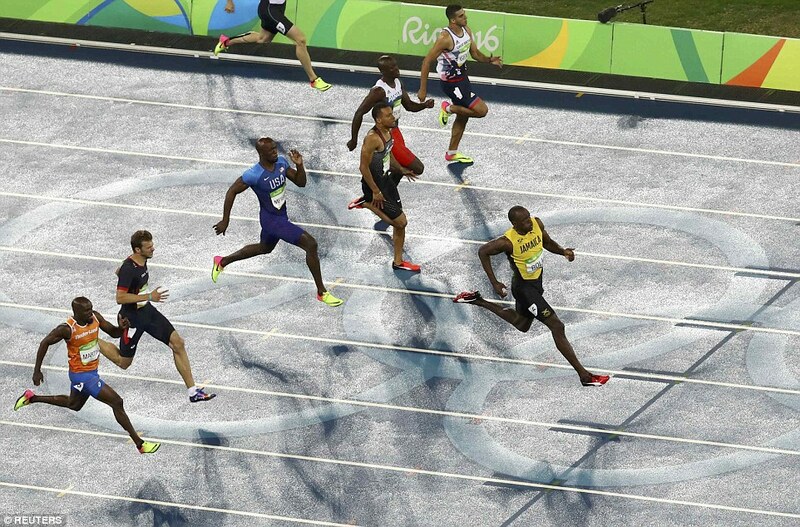 The race was never really against his competitors as much as it was the clock for Bolt, who had his heart set on beating the Olympic record he set in the Beijing games eight years ago. 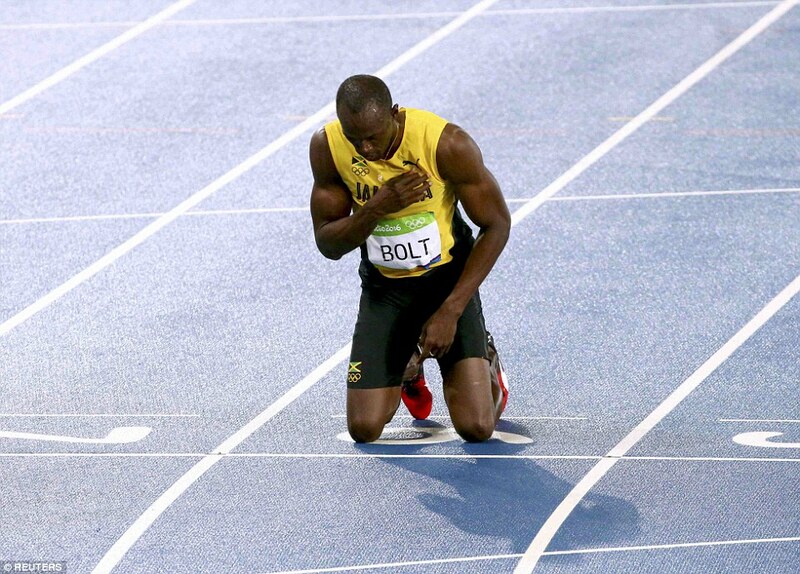 A showman through and through, Bolt’s signature smile soon spread across his face as the crowd road and he knelt on the track, taking deep breaths and punching his heart in victory. One Love by another of Jamaica’s famous sons Bob Marley played as Bolt grabbed a Jamaican flag and did his lap of honor, singing along to the lyrics as he jigged and blew kisses to the adoring crowd. He cupped his ear laughing as they sang ‘Usain Bolt, Usain Bolt’ and then went into the crowd to help with spectator selfies as worried security officials watched anxiously. 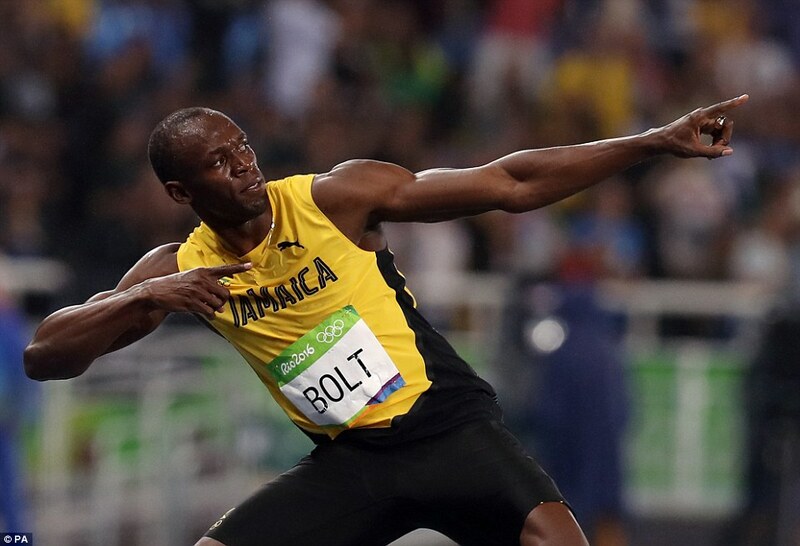 Bolt toyed with the crowd, declining to launch into his trademark ‘ Lightening Bolt’ celebration. But when he had completed his victory lap, he returned to the finishing line he had just crossed for his eighth Olympic title, sank to his knees, crossed himself and rose to his feet unveiling his famous sign. 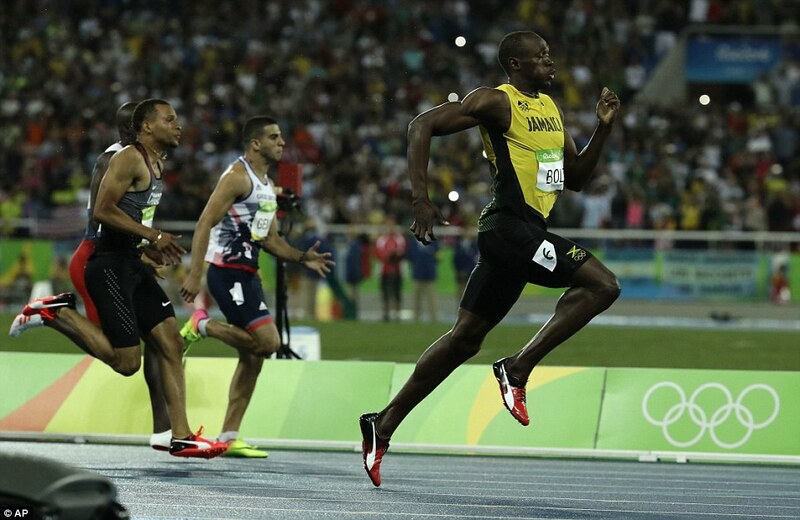 Bolt later told reporters that his body ‘wouldn’t respond’ to him as he came into the straight. ‘I guess it’s just age and all the runs has taken a toll,’ Bolt said. ‘19.79 is a great time. I really wanted to go faster,’ he added. 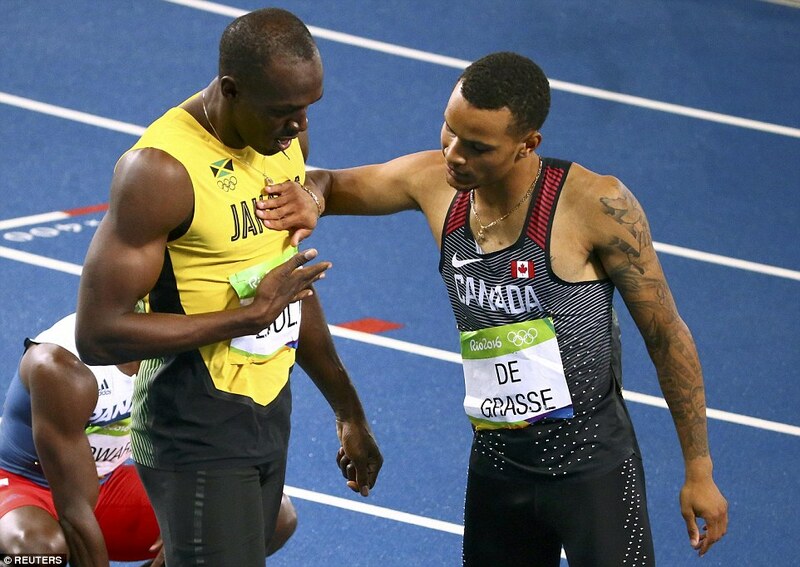 Canada’s Andrew De Grasse, Bolt’s friendly rival in the 200m semifinal, took silver with a time of 20.02 and Frenchman Christopher Lematre won the bronze. Britain’s Adam Gemili crossed the finish line at the exact same recorded time as Lematre, at 20.12 seconds, but was denied a medal by three thousandths of a second. USA’s LaShawn Merritt placed sixth in the event. 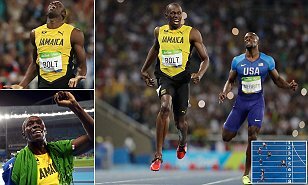 With his eighth gold, Bolt already stands to become the sprinter runners will spend a long time in the future trying to catch up to. He declared he would reach immortality if he were to clinch three straight golds in each of the 100m, 200m and 4 x 100m relay in Rio. But tomorrow the man known as ‘Lightening Bolt’ will also have to rely on his three Jamaican teammates to help achieve his dream. 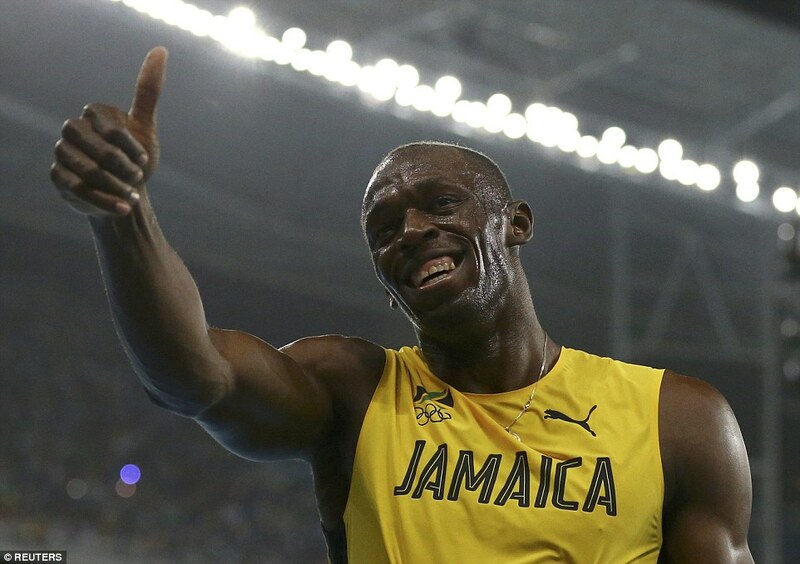 But Bolt is the long-standing King of the Sprints and on Friday night he did it all alone, cheered on by a near capacity crowd in the 47,000-seater stadium. He was already the most successful sprinter in the 120-year history of the Olympic Games before Rio and with 200m gold, he further sealed his place among the all time greatest. 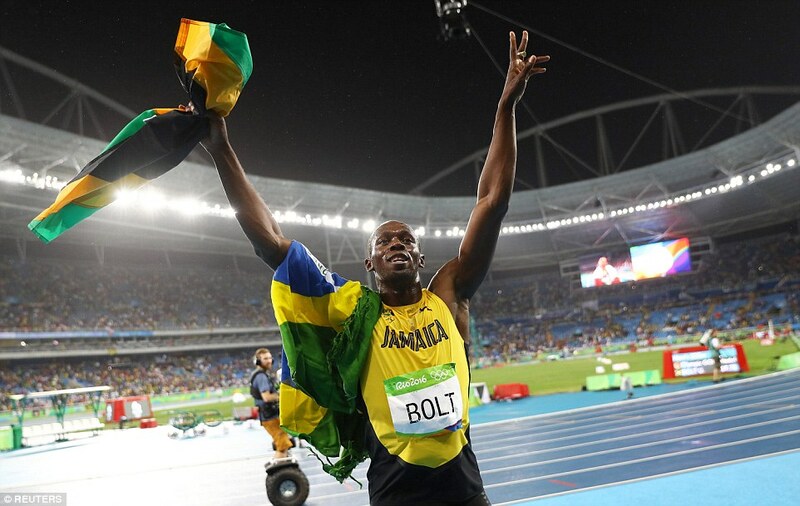 Bolt has said repeatedly he wanted to join the top rank of sports elite along with Pele and the late Muhammad Ali. 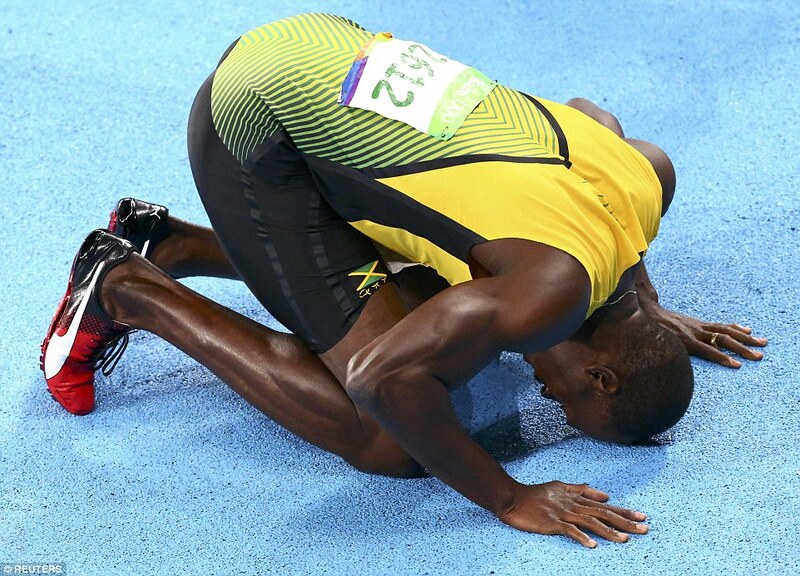 There can be no question that Bolt is already there, and that those who have witnessed each devastating defeat of his rivals knew they were privileged to have had their seats in the arena where history was being made. Bolt had set his heart on breaking his own 200m world record of 19.19s, which he set at the 2009 World Championships, while in Rio. He had reached the Olympic final with a season’s best of 19.78sec – and said he could go faster. Bolt had twice broken the 200m world record, setting 19.30 in 2008 in Beijing and the record from 2009 which held until Thursday evening. His main rival Justin Gatlin of the US failed to reach the final blaming an ankle injury, and Bolt knew this was his best chance of gold and breaking the record. 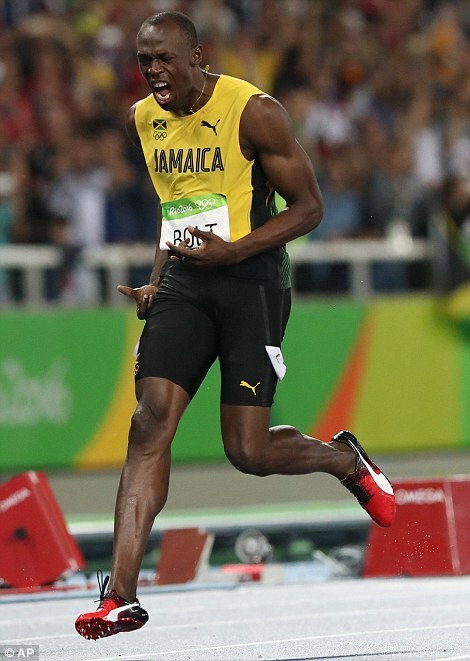 He had smirked and even mocked his opponents in his heats as he showed them a clean pair of spikes. But he was nothing less than serious as he had the last word.